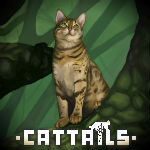 If your cat was an NPC | Cattails: Become a Cat! what would they look like, what would their personality be like, their den description, what they love and hate? Looks: a pretty frost tabby with a gold bell and folded ears. the bell doesn't make a sound, but its her most treasured Item. 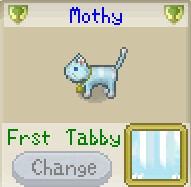 Personality: Mothy is a very Timid she cat, but is very goofy and clumsy once you get to know her. Den disc. : Mothy's den. the inside is lit up with fireflies that are scattered in the corners! very cozy. Loves: CatNip, squirrels, and fireflies. "w-wow! for me!? I love it!" Neutral to: herbs and berries "huh? th-thanks. I appreciate it." Dialog : First meet "...um...are you...talking to me? sorry..oh! are you new? I'm mothy...you are..? *insert name*? well um..nice to meet you. I'm not good with names so sorry if I forget." | Intro 0 stars ".......I have nothing to say to you?" | Intro 1 & 2 stars "....It was *insertname* right? thanks for talking to me..It's nice to talk sometimes." | Intro 3 & 4 stars "Hehe. Hi *insertname*! how's my friend doing on a day like this?" | Intro 5 stars "*insertname*! so happy to see you! we should catch fireflies together sometimes! oh, you wanna chat?" | Redrose at 5 stars "you- you! you think I-? um um. yes! I would love to date you!" | Redrose under 5 stars "um....this probably isn't for me..."
| Dating "Hello my snow flurry. hehe. that nickname suits you!" | shiny trinket at red heart "I-I'm gonna cry! I love you so much! can't believe would love someone like me! yes!" | shiny trinket before red heart "um...not sure if you should waste that on me.."
| Married "I feel so whole and better about myself now that you are with me, my love~"
|giving a gift "I saw this and HAD to give it to you!....hope's it's okay"
| Summer "*sigh* summer is way to hot...I hate this heat. I hate getting wet, but, I wouldn't mind if you splashed some water on me... "
| Fall "the leaves are so pretty! I should go for a stroll soon" Fall2 "smell the autumn air? I love it!!" | Winter "Finally winter! It's a bit chilly, but it's my favorite!" Winter2 "I saw a human rolling around in the snow earlier! looked like fun. wanna try?" | Spring "all the snow melted...I'm a bit sad." Spring2 "the scent of flowers are nice, but, a bit overwhelming don't you think?" | Snowing "Look! it's snowing!! I feel like dancing!" | Rain "ugh. I hate getting wet. should have stayed inside." | Fog "perfect weather for hide and seek." Bonus: two of the kittens will have folded ears like her! This is cool! I might post my own cat later! Personality: Quiet but watchful. Always aware of his surroundings, and loves hunting in the forest at night on his own. 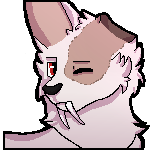 Dislikes most cats, but develops a sense of strong loyalty and friendship towards the few cats he warms up to. Den: Dark and damp with moss growing on the walls. Smells ‘woodsy’ with a pile of acorns gathered into a corner. Dislikes: Anything ‘unnatural’ or man made. And dislikes bugs. (Disclaimer) I have nothing to do with Falcon development, Falconwing is just the name of my OC. Sorry for any confusion. Personality: Watchful and wary of strangers, but a smart, quirky, friendly chatterbox once you get to know her. She isn't much of a fighter, but loves hunting. Has a crush on both Robin (I'm calling him a boy in-game) and Arthur. Torn between the two. Dislikes: herbs, terrified of bugs. Will run the other way if a bug is coming. Looks: Has 'Snowday' fur and wears a spiked black collar. Personality: A very curious cat. She's fond of hunting prey and birds. She also likes to catch butterflies and bugs. Den: A wide space under a tree stump. Has a farm of berries and catnip in her den. Likes: Birds, Rabbits/Hares, Catnip, Mice and gemstones. Dislikes: Rock Debris (>:ccc), Toads and Frogs. Looks: A light grey she-cat with dark tabby markings and messy fur. A deep purple collar laced in spikes rests rather loosely around her neck. Personality: Quiet and self-reliant, often can be observed staring at something unseen. Very mysterious, never really opening up or being particularly friendly even at max friendship. Den disc. 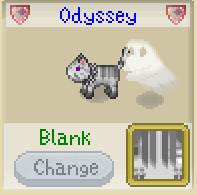 : Odyssey's den. Very dark.. Upon squinting it is full of Snake lilies and a few fish. Loves: Snake lilies, All fish, Frogs, Toads, Turtle meat, and Lunar Butterflies. Hates: Catnip, All other prey items, Rock Debris, and all Lady bugs. Don't mind me too much, please. 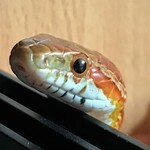 Looks: An albino savannah (red eyed) with the left half of her face bitten off and her left ear gone. Wears an unbreakable black string that is ripped apart at her chest. She also has bear scars on her chest. She has saber fangs. Personality: Rainbow is a cat who seems to be old and has been through a lot of horrors. She doesn't say much at a low friendship, but when her friendship is high she starts to chat about random things all the time, and often talks about her own past without realizing what she just said. Loves to show people her artworks. Den disc. : Rainbow's den. The inside is filled with the scent of birds, mechanical stuffs (tablets) and paper. You can also see a picture they drew themself of what seems to be them and their old family. Loves: All birds, the usual rare stuffs, shiny trinkets (probably able to be married), salmon, and black firefly. Hates: Berries, all other bugs, snake lilies, toads, or generally anything poisonous, valerian and lavender. Personality: Very rarely speaks, most of her responses don't even have words but are ellipses or emoticons. She has an unsettling smile. Den Desc: Ghost's Den. Barely anything can be seen and the dark is almost exaggerated, just inside the entrance you can barely make out the bodies of black fireflies sucking the light out of the den. Ghost is amazing I'd romance the heck out of them. It still looks like a boy to me, not a girl.